The Blade first arrived at Alton Towers in 1980 and had its home in Fantasy World (currently X-Sector), simply known as The Pirate Ship. As you may have probably guessed, the ride was themed as a giant swinging pirate ship, like those of so many other parks. However, in 1996 the ride disappeared, along with the rest of Fantasy World, in order to make way for Oblivion and X-Sector. It reappeared the following year over the other side of the theme park, with a whole new theme. Gone were the pirates, and instead the ride had become rusty with peeling paintwork, yellow and black hazard markings, and two huge metal blades on either end of the ship. This created a very daunting and hostile look - exactly as the park intended, because the ride was now in Forbidden Valley, and had been themed accordingly with its new name: The Blade. 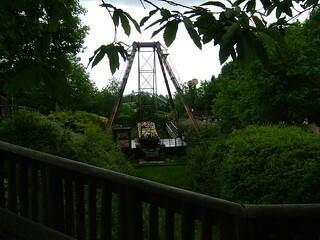 The Blade sits in a sunken pit which used to house Thunder Looper. Whilst onlookers may think the ride looks fairly tame, do not be fooled! The ride is much more thrilling than first meets the eye, due to the deceptive height. In 2015 The Blade was at the centre of a rumpus when it did not feature on the park map fuelling speculation that it would be removed. 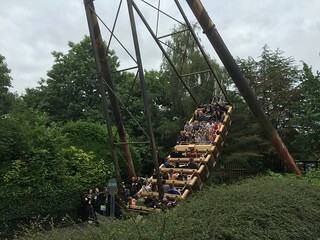 Alton Towers later confirmed that the ride was due to be leaving though would continue to operate for the first part of the season. Following The Smiler incident however plans to remove the ride in 2015 were shelved but get your rides in whilst you can as it looks likely the ride will be departing sooner rather than later.